At the end of May 2013, I started a $1,000 investment account with Lending Club and I’ll be updating you on the progress on a regular basis. 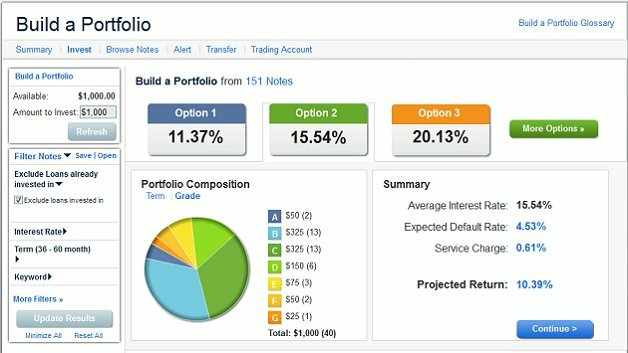 This is not my only investment with Lending Club, but I want to create a publicly tracked portfolio and share lessons that I learned with you. Note that I only start to do peer-to-peer lending again, now that I have a well-funded retirement account and some extra money to invest. As of 12/1/2013, about 6 months after the original investment date, the total portfolio value after adjusting for charged-off loans and late loans is $1,021 — this represents 2.1% gain, or 4% APY. This is a big drop from the initial expectation, mostly due to poor result from the Trading Account experiment as I elaborated last month. I already have a Lending Club account, so it was an easy process for me to deposit $1,000 into the account. The deposit does take a few days to show up in my LC account (this is something they can certainly improve upon). Anyway, once the fund was available, I just use their Build a Portfolio tool (just click “Invest”). I chose 36-month only loans and the rate drops to 13.71% (projected 9.3%). So I reversed this and included both 36-month and 60-month loans. I completed the process and saved the portfolio as 2013 Portfolio A. One thing you will realized quickly is that not all loans will be funded, so you will have to go through this process a few times to invest all of your money. I don’t expect the investment to yield 16.70% based on the Weighted Average Rate above because some loans will default (e.g., the borrower stop paying altogether). I think I’ll be happy with a rate of return around 6-9% and thrilled if I ended up with anything higher than 9%. I will update this article about a month from now. As of 11/6/2013, about 5 months after the original investment date, the total portfolio value is $1,107 — this represents 11% gain, or 26% APY. At this point, I have to admit that my Trading Account investments are not working out. 4 out of the 6 notes purchased through the trading platform are late and most likely will be a total loss. Excluding these 4 notes, plus the one defaulting note from my regular portfolio, the adjusted portfolio value is $1,030 — this represents 3% gain, or 7% APY. This is not quite the result I was hoping for. As of 9/28/2013, about 4 months after the original investment date, the total portfolio value is $1,105 — this represents 11% gain, or 30% APY. Unfortunately, there is a problem brewing. The original loan is still doing well, only on late D1 loan that is 31-120 days late. I tried to sell in off in the Trading Account at FOLIOfn, but no luck so far. The 6 Trading Account notes I bought looked good initially, with 2 notes went from late to current. However, September has not been good. 4 notes still stuck in late category and one went bad again. Discounting the bad notes, we are potentially looking at $70 loss, which means the we are more realistically looking at 3% gain over the past 4 months, which annualized to about 10%. As of 8/30/2013, about 3 months after the original investment date, the total portfolio value is $1,062 — this represents 6.2% gain, or 24.9% APY. The late D1 loan from last month is now 31-120 days late. As a result, I signed up for a Trading Account at FOLIOfn and I am trying to sell the loan for $9.99 (no one want to buy it yet). I also decided to buy some loans through FOLIOfn, I bought 4 late loans for $53.56 and 2 are already paying again. If this strategy works out, I can get a much higher yield by buying carefully selected loans from FOLIOfn at a deep discount. Lastly, I have one B4 loan that already paid back in full so that freed up some money for investing. As of 7/28/2013, about 2 months after the original investment date, I received $20.42 in interest payment on my initial $1,000 investment, and $22.26 in principal was repaid. This allowed me to reinvest and buy another $25 loan and there are now 41 loans in my portfolio. Also, there’s currently one D1 loan in grace period (the first step toward a loan default). A default means I would lose any loan amount not repaid, and any potential interest I expect to earn from that loan. At this point, we are looking at about a 2.04% gain, which annualized to approximately 12.25%. I still have two loans that are still in review, so the rate of return may increase slightly once all the loans are fully invested. As of 6/28/2013, about a month after the original investment date, I received $9.24 in interest payment on my $1,000 investment. This is about a 0.92% gain, which annualized to approximately 11.09%. The rate of return may increase slightly once all the loans are fully invested; however, it could also decrease as a result of loan defaults (which should be expected with this type of investment). Until then, please share your thoughts in the comment section below. I’m sorry your investment didn’t work out. But for the record I think Lending Club itself deserves some non-payments just to get the approval guys down off their high horses! I went to several P2P loan sites after reading this article and I think some of them stopped me at the door – I didn’t even get to post my request to the site because they thought I wasn’t good enough. But it’s amusing to see that people in the A and B categories take the money and run on these sites. Hah! My credit is bad NOW but my income is steady and I’d pay back any loan given to me if the agreed upon monthly payment wasn’t outrageous. But they said I wasn’t good enough. Hope they enjoy getting ripped of by “A’s and B’s”… Hah! Sorry to hear about your poor performance. I’ve been with Lending Club for 1.5 years now with both a retirement and taxable account. the taxable is riskier, but both are still going strong at ~10% annual return. I got a bit scared a few months ago when a few defaults occurred at once, but since then its been smooth sailing. I have almost half my portfolio in Lending Club. I guess that’s supposed to be risky? I don’t see it being more risky than stocks though. Needless to say, my other half is in dividend stocks. Thanks for this post. This was something i was considering testing out. After reading, i might have to do more research before i put down my money. I was looking to test this out on Prosper. I have not heard much about investing in loans with Lending Club. Have you heard of bitcoins? What do you think of them as a viable investment? Hello Pinyo, I knew about Lending Club through your website. Thanks in advance. By the way, did they accept international application? @Faeiz – Thank you. Unfortunately, LendingClub is only available in the U.S.
Owh, too bad. Thanks for your reply. Keep create great content! When do you see the returns on the loans? After they have been paid in full? For example: If you invested $1,000 with an return rate of 10%, you would make $100 after the loan has been paid off? I’m new to this, so trying to understand the rewards. Thank you for any insight that you can provide! The loans are repaid monthly, so you get a little bit back at a time (principal and interest). Loans are usually paid off in 3 years or 5 years, but some borrowers do pay it back earlier (and some may not pay back what they owe). The rate is annualized, e.g., at the 10% annualized rate of return, you get $100 back each year. @Smitty – The borrower pays back the loan monthly. The set up is similar to a personal bank loan, where the borrower borrows a lump sum and pays back 36 or 60 equal payments monthly. I’d love to try this out, but I’m afraid of the defaults. What protections do lenders have via this website? @Sam – You have to factor in the defaults. But LC will also try to collect on your behalf when a borrower fails to pay. However, it is an unsecured loan so you’re out of luck if the borrow insists on not paying.